As if on cue, snow has arrived in this corner of southwest France and very festive it is too. 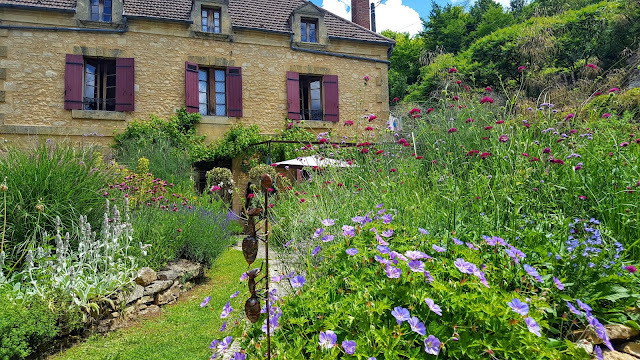 The chateau at Campagne, a hamlet just nearby looks as if straight out of a fairytale or perhaps the set for Merlin. Just perfect. 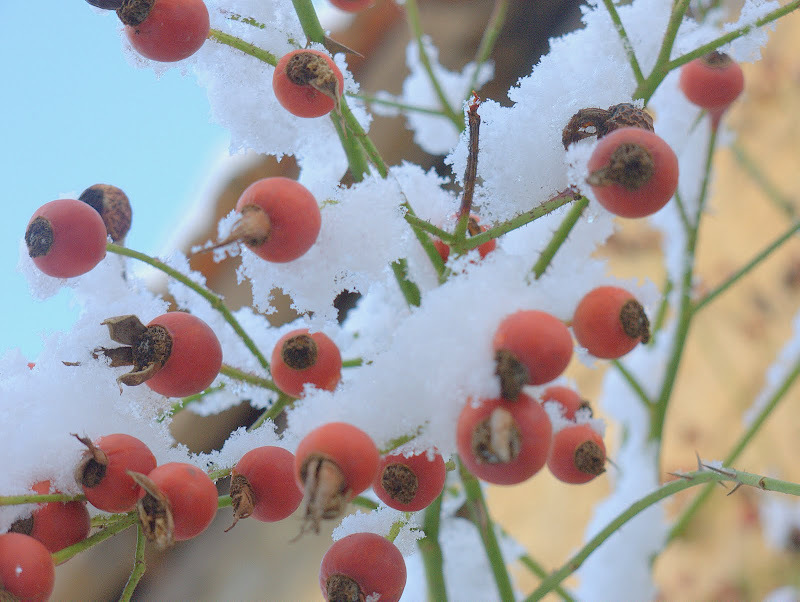 Even rosehips have a yule-tide ring to them, napped with a little white stuff, good enough to hang on the front door. Equally of the season, though a little more curious are the bunches of mistletoe growing in the trees. 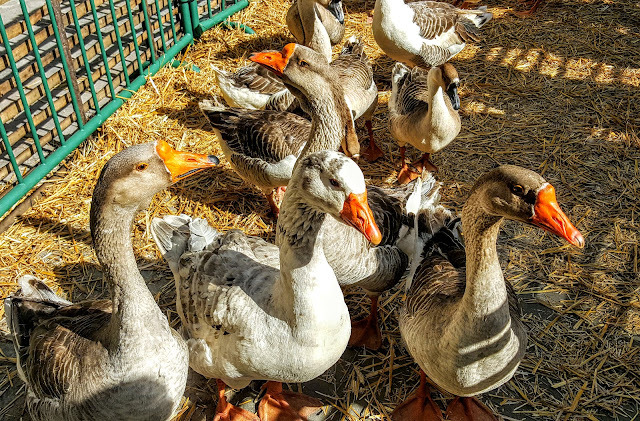 I came across these just outside Bergerac on the route de Bordeaux. I just need to 'shin' up and take a bunch. Well everything winds down for Christmas now as I contemplate the travel chaos that is Europe at the moment. If I can cross the channel without stress then I'll be thankful! I wish you and yours a very peaceful Christmas and a happy new year. Lovely photos Rob I think the shin up would be a rather long one. I hope any travelling you do is without troubles. Have a lovely Christmas. Lovely post. You are right...it is out of a fairy tale. Hope you get safely, and quickly home for the holidays without those terrible weather delays. The trains in the channel -- I would have been freaking out as I am so claustrophobic! We don't have mistle toe in this part of he world, so love your pic's of them. Trains are a novelty in Canada, we just fly, although, that can be quite treacherous at this time of year. Snow, ice, thaw, fog, ice, snow, fog, you get the picture, delays delays delays. But eventually everyone gets to their destination! Beautiful pictures! The snow on the building in the first picture does look right out of a fairy tale like you said. Merry Christmas! Wishing you peace and happiness at Christmas and in the new year Rob. 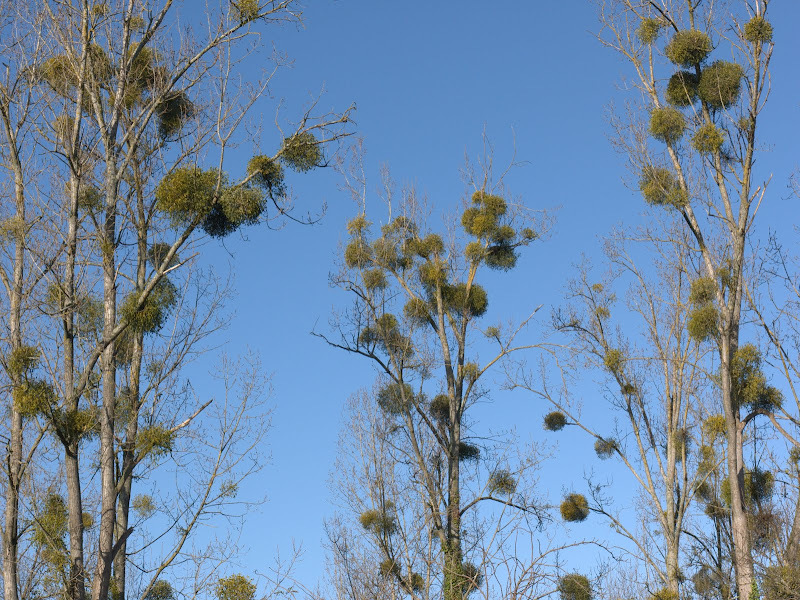 I have never seen so much mistletoe in my life as I did a couple of weeks ago on the journey from Strasbourg to Paris. As in your photos it dripped from the trees. Safe journey ! 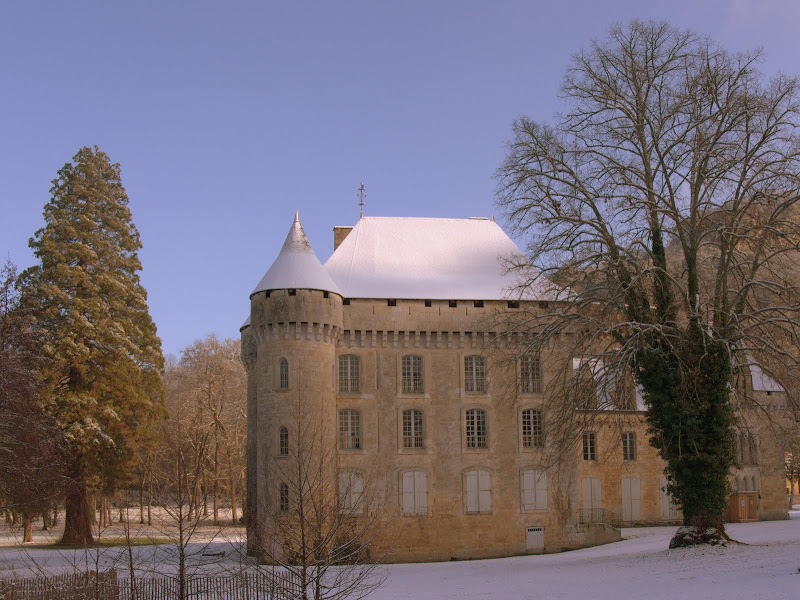 The snow looks so pretty around the Chateau! I believe you might live in the most beautiful spot on Earth! Have a great holiday! These photos are certainly putting me in a Christmasy mood - think I'll shut down the computer and wrap some presents now. 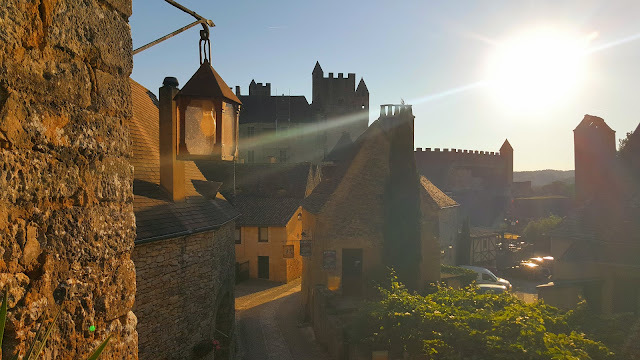 The castle truly does look like something out of a fairy tale. Beautiful. DH told me that his family used to shoot mistletoe down from the trees. Have a wonderful Christmas holiday! Have a lovely Christmas, Rob and hope your travelling is stress free. 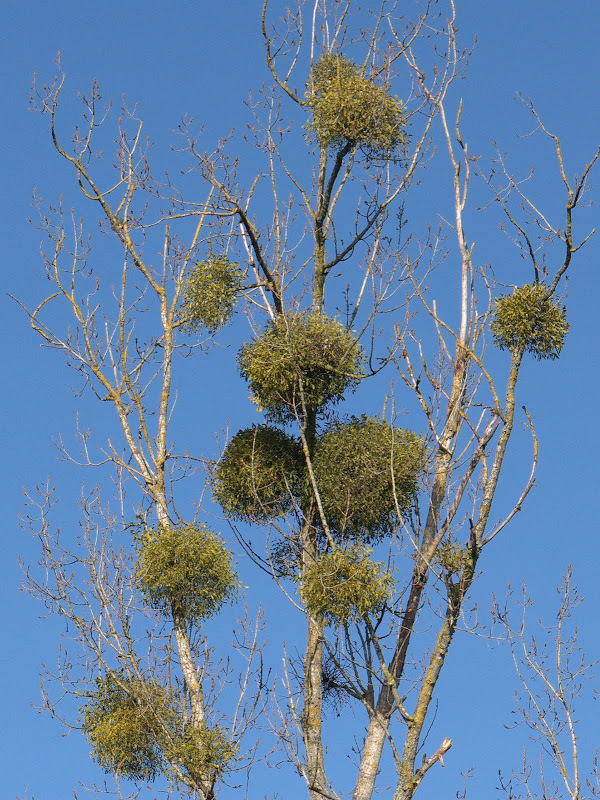 Love the mistletoe photos - the clumps look like giant pom-poms! Lovely! Great pictures Rob! Merry Christmas and a Healthy and Happy New Year! Does that country ever take a bad photo? Everything looks so amazing there. -Hilde, slowly becoming permafrost. Brr! Rob, Thank you for a year of beautiful posts! Hi Rob, news here were telling that Europe was very stormy and cold, hope your tiny plants are safe under a roof and your travel goes very easy. Wish you a blessed and very happy 2010, and many more years of happiness in the outdors. Your lovely photos of mistletoe made me smile as it reminded me of larger-than-life friend from Texas, who told me her Dad would shoot mistletoe out of trees so she could sell it for extra holiday money for presents.